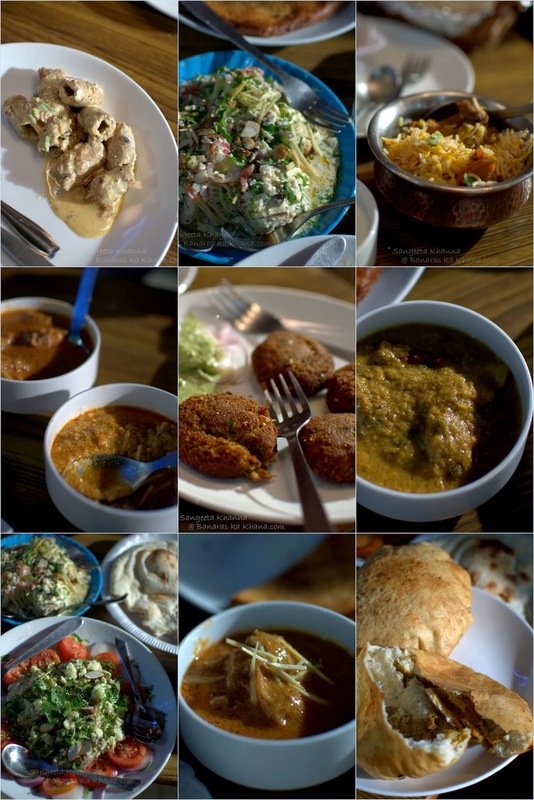 We have been in love with the food from purani dilli already. That ishtoo from Al Jawahar is legendary, Korma from Karim's and those small hole in the wall shops that sell wonderful kababs, kheer, halwa and many such foods from the past. Matia Mahal in purani dilli is a place well preserved in time as the aromas, the sights and sounds remind you of older cities, the smaller towns and food from your grandmother's homes. 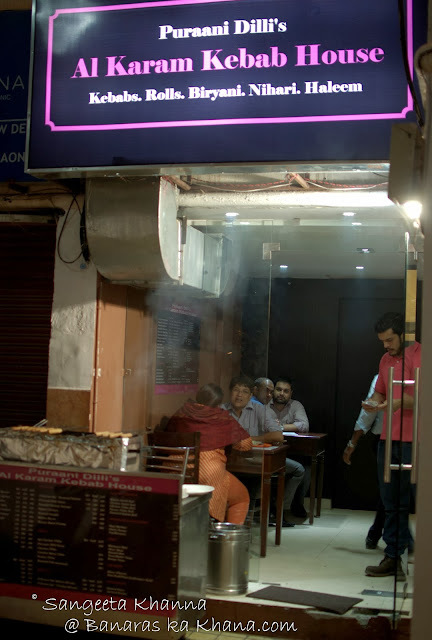 There are many old nuggets to find every time you are there and that is how Varun Veigas, a young pharmacist happened to be dining at Afsar's Al Karam and he struck a chord with the owner Umez bhai, who came across a friendly person and pointed him to other places of interest around Matia Mahal. Varun asked Umez bhai why he was not taking his food outside the walled city and that is when he felt that these people want to showcase their talent but lack of opportunities and may be a lack of business acumen too, is holding them back. 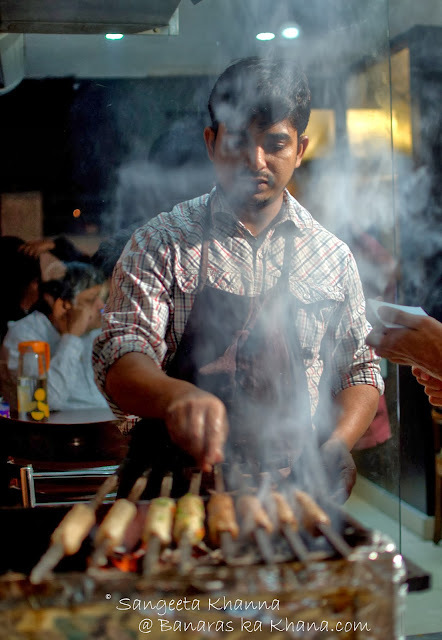 He invited them to Gurgaon, Umez bhai and his team followed suit and the rest is making ripples in the food world of the millennium city, that is Gurgaon. Purani dilli Al Karam Kebab house is located at DLF phase 4 market amongst many nice eateries around, we found it jam packed when we arrived and this was just after a week of its existence. You know what I mean. Very basic interiors, reminding of the eateries of purani Dilli, a kabab grill at the entrance completes the picture for you. I was there for a private tasting session and the array of kababs (or kebabs) and curries from the walled city was just perfect for the onset of winters. The grilling of kababs over charcoal is such a winter thing and one is awestruck by the way they painstakingly prepare the meat, tenderising it with raw papaya, spicing it right, wrapping it around the skewers and grilling them perfect before you dig in. We tasted the Seekh kababs, Kakori kababs, Gilafi kababs, Dhaga kabab and Shami kababs. 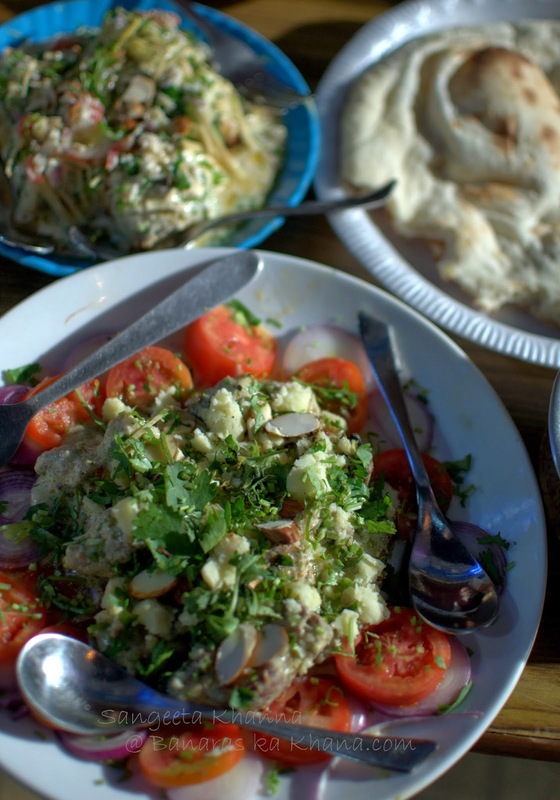 You would find chicken tikka and malai tikka etc as well. 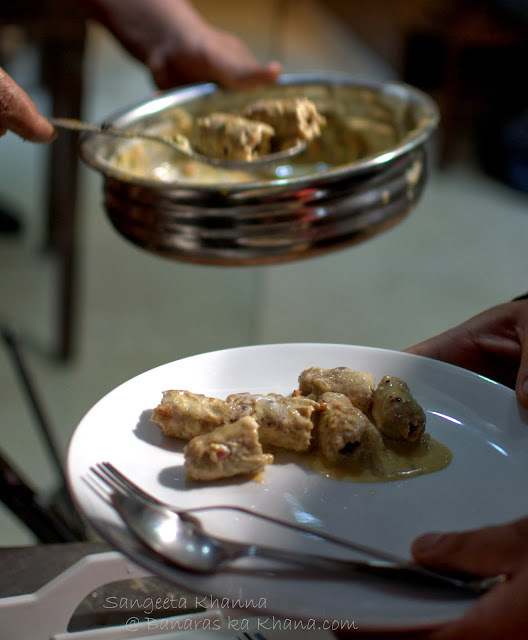 Seekh kababs are succulent and soft, meaty and robustly spiced. The green boorani chutney and onion rings that are served ont he side do absolute justice with these delicate textured kababs. 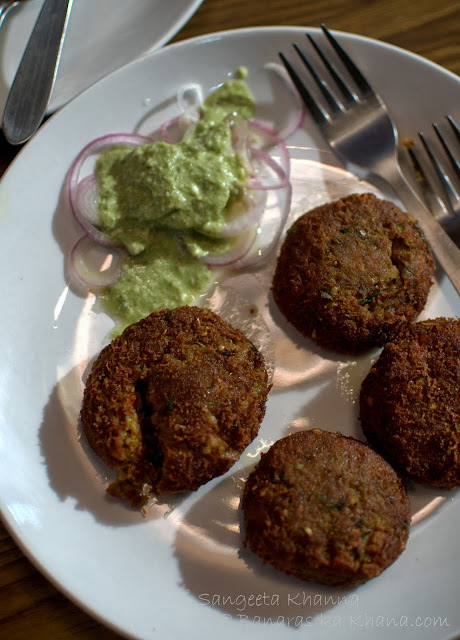 Kakori kababs are a bit milder in spicing with bits of cashew nuts strewn in. 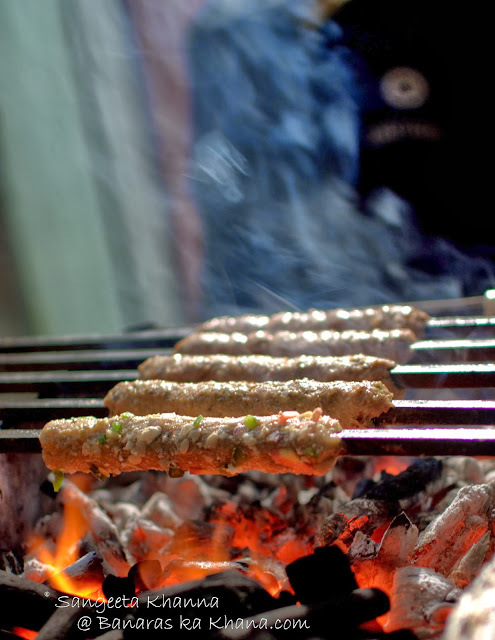 These are the kababs you can have anytime. They would make a nice meal by itself wrapped in roomali rotis along with onion rings and that chutney. Gilafi kabab came in a white creamy sauce. Buttery, creamy and delicious. Bits of vegetables and a rich sauce makes it suitable for all those who love milder spicing as all the fats tone down the spices. Shami kababs were a bit more robust on spices than I like normally, but good taste nevertheless. This would be lovely with a ulte tawe ka paratha may be, or roomali roti. I can't eat much rotis or parathas, just a few bites and I feel full. But kababs I can eat on their own, the onion rings and chutney for company. 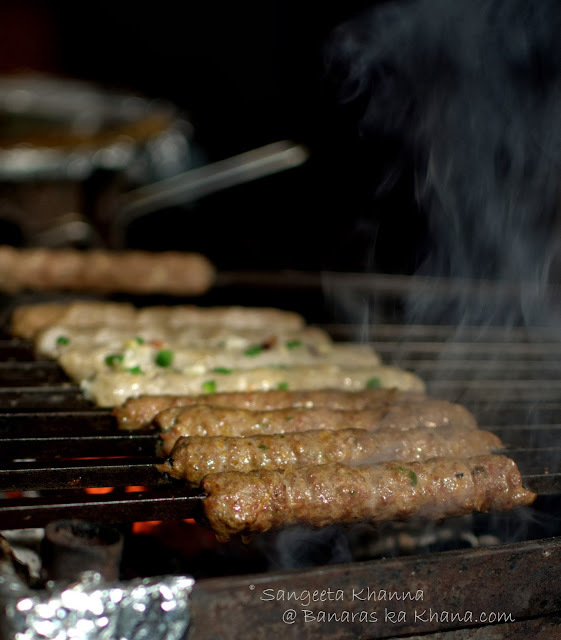 Dhaga kabab was a threaded seekh kabab, delicate meat sausage secured with a string. More of a drama than taste I think, taste wise all kababs were great. And then there was this Achari biryani. I had never had a biryani made with pickling spices, this one was a good surprise. The good thing is, they serve biryani in a quarter portion as well, priced really affordable even for students. 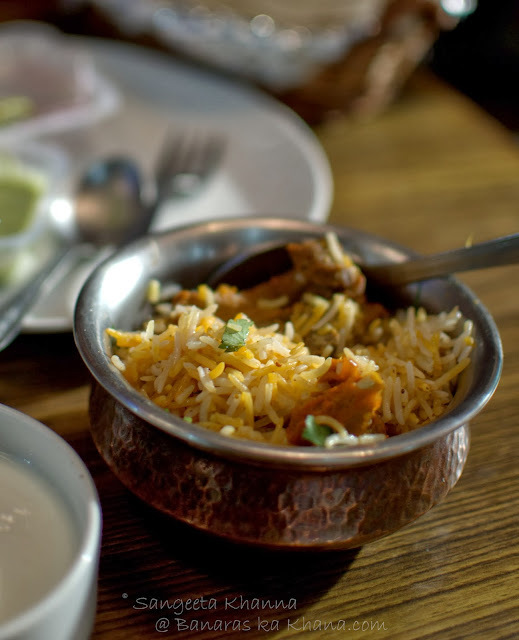 The biryani is served with a generous helping of fresh yogurt and makes a nice meal in itself. Loved the Haleem with a generous layer of ghee floating on it. Rich with nut paste, the haleem doesn't miss the taste of lentils in it, the way I like it. I recommend the haleem strongly if you want another main dish after you order the kababs and Nihari. Nihari is a slow cooked dish that originated in the walled city of old Delhi and at Al Karam kebab house, this will be another bestseller I feel. Well done. The Ishtoo (mutton stew) was good but I like the Al Jawahar Ishtoo better. Korma was nice and well balanced, both of us loved it. What surprised me after having these robustly spiced kormas and ishtoo, was a white chicken curry they named Kashmiri chicken. The curry is milky, lot of cream and nut paste in it and raw khoya sprinkled on top along with ginger julienne and coriander greens. The flavors were not Kashmiri at all, but reminded me of the curries of my own Banaras. Khoya, milk and aromatic spices dominate the kormas and curries of Banaras and this one had a hint of that mildness. A yummy chicken curry with khameeri roti, just don't look for anything Kashmiri in it. The chicken Badami was another surprise. I had never eaten anything made with just the gizzards and hearts of chicken and this curry was a milky creamy stir fry of sorts made just with those. Surprisingly good, I recommend if you like gizzards just like Arvind does. We tasted everything in small bits and were full by this time. I requested Varun to get really tiny portions of Kulfi when he insisted we have to taste all 4 flavours. These are Kuremal ki kulfi sourced directly from purani Dilli so there was never a doubt about the goodness. Anjeer kulfi is yummy, kesar pista is not a favorite but still I loved it. But the best was Pan kulfi which had a whole betel leaf in it. The best paan I have ever had, in any form I must say. Orange kulfi is something I wont order when there are such good options to choose from. 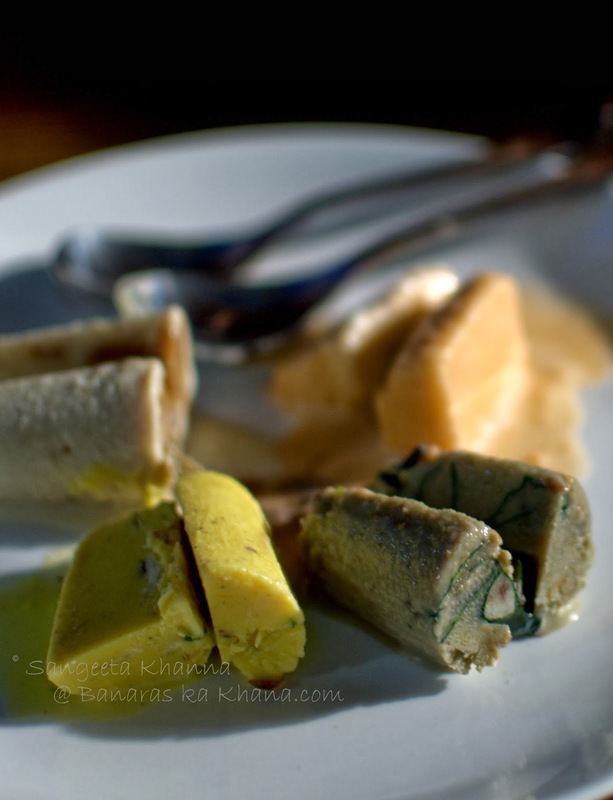 These kulfis are the best money can buy, a result of generations of kulfi making. I have always loved the way our traditional khansamas cook, the almost religious faith they have in food and it's powers of winning hearts. The wisdom and knowledge that is passed on to generations, the cooking techniques that are perfected so much they don't need to check temperatures and cooking time, it becomes instinctive for them. I love it how they watch people eating their food with a great satisfaction, taking all the praise with a faint smile always. There is a hint of pride in the food they cook and we could see how the Al Karam team was glad to see we liked their food. Enough to get smitten by the old world charm. Hi Sangeeta ji, I am a big fan of your blog and love your writing as well as your recipes. I am based out of Gurgaon and tried Al Karam some days back. I just wanted to share that unfortunately both me and husband were very disappointed with the place. I ordered a take away of Nihari, Gilafi Kabab and Seekh Kabab. Since I belong to Lucknow and have stayed in Purani Dilli as well, I am aware of the difference between a Quorma and Nihari. I was saddened to see that they had packed Quorma instead of Nihari. Next were the Gilafi Kababs. Instead of being 'light on spices', they were so spicy that both me and husband had to take antacids after eating the Kababs. The Seekh Kababs were just plain ordinary. I was extremely disappointed with the eatery :( Do you have any other better places to recommend in Gurgaon? Hi Fariha, I am so sorry to hear your experience at this eatery, I can't believe they would mix up Nihari and Korma. You can give your feedback to them and I am sure the team would take appropriate action, they are quite passionate about what they do as much I saw them working and serving food.